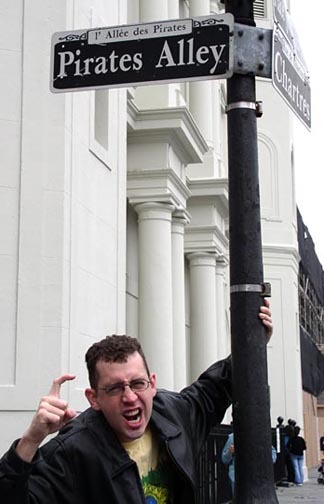 A FRANK Tale: New Orleans | Have YOU Ben Starr Struck? Jennie and I both love New Orleans. We’ve never been there together, unfortunately. But we’ve each enjoyed some potently inspirational trips there separately, and when it came to deciding this March’s FRANK theme, it was a no-brainer. Normally we fight for a few days to come up with the theme, but this one transpired effortlessly on a hike with our puppies a couple of weeks before hosting FRANK. Mardi Gras would pass on Tuesday, our invitations would go out on Sunday, and a run of 4 back-to-back FRANKs would ensure the following Thursday. This FRANK turned out to be a bit more intense in the educational realm than most of our dinners, simply because Cajun and Creole cuisines are fairly recent newcomers to the global cuisine scene…and most people have no idea what the difference is between the two. Enter FRANK, because we’re all about education. The more you understand food, the more you can appreciate it, right? So what are these two cuisines that developed in the swamps of Louisiana and have taken the world by storm in the two short centuries since they developed? Bear with me for a short history lesson, because it will make Cajun and Creole food taste even better after you understand where it came from. 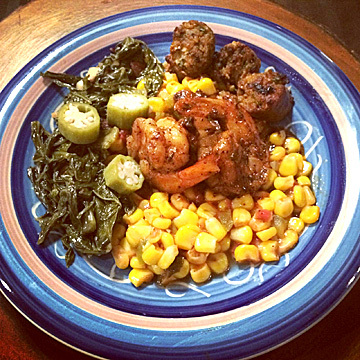 The cuisines of Louisiana are the original “fusion” cuisines. They evolved from the influence of six wildly different cultures: Native American, French, Spanish, African, German, and Italian. It all began with the Native Americans, who inhabited the area now known as Louisiana for centuries before the Westerners arrived. While European explorers described them as “savages,” archaeologists tell us that during the reign of Ramses II in ancient Egypt, the Native American tribes in Louisiana territory had established a sophisticated societal structure, and had advanced agriculture and trade arrangements with other tribes from thousands of miles away. 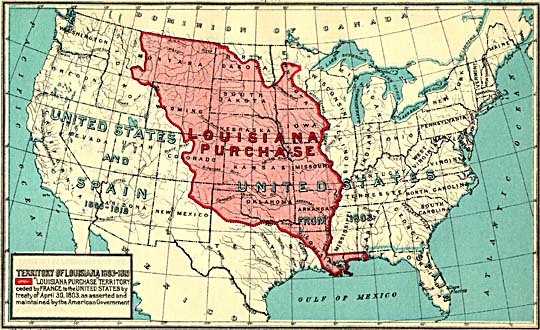 The French were the first to claim Louisiana, and it was originally huge, stretching all the way from the Gulf of Mexico to Canada. The first settlers were a motley crew…prisoners and whores and priests, as well as wealthy folk who arrived with their chefs, already well-schooled in the most advanced cuisine the world had ever seen. These chefs were as sophisticated as any on the planet at the time, but they found themselves in a new place with weird ingredients they weren’t familiar with. 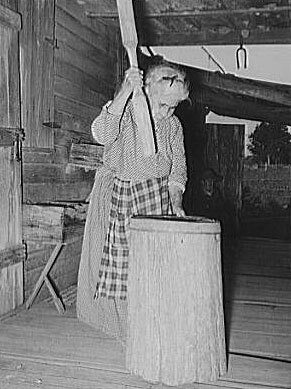 Luckily, they learned from the Native Americans, who were happy to teach these cooks how to deal with these new ingredients, namely corn and beans, and ground up leaves of the sassafras tree (called filé) which was an important thickening agent in early soups and stews. The cooks began applying French technique to New World ingredients. Soon came another wave of French settlers: the Acadians, who had previously settled in northeastern North America (mostly Canada) but had been forced out by the English. These were not rich folks with chefs…these were poor farmers, forced off their lands, who settled the swamps of Louisiana and became the Cajuns. But more about them later. Next came the Africans, forced to come and work the cotton plantations as slaves, but who left the most indelible mark on the cuisines of Louisiana. They taught Louisianans how to grown rice, which has become the backbone of the cuisine. They also introduced okra, which surpassed filé as the primary thickening agent for soups and stews. 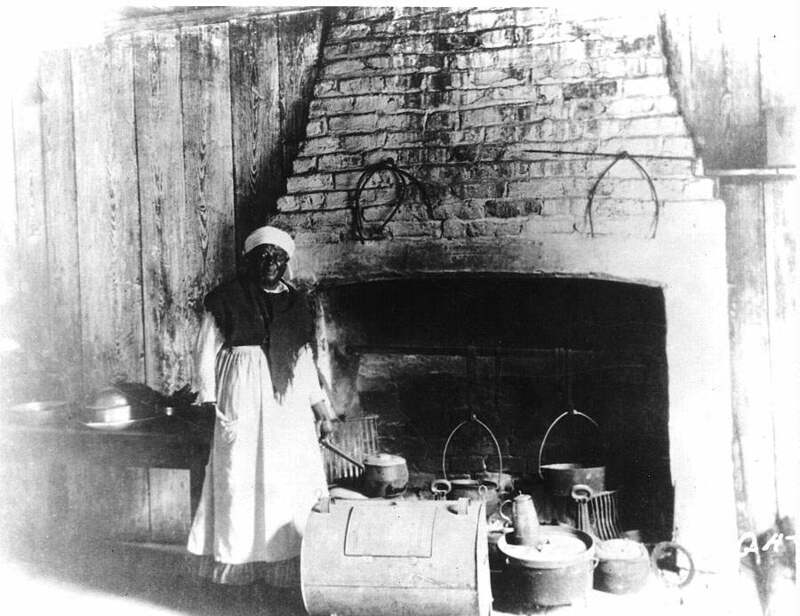 They became cooks for the wealthy plantation owners, and unlike slaves, who were treated as property, the plantation owners often revered the cook as family member, which allowed African ingredients and techniques to thoroughly saturate the cuisines of Louisiana culture. After slavery was abolished, Italians immigrated to Louisiana to work the plantations and the seaports. Italians are experts with seafood, thanks to their seemingly unending coastline, and they refined Louisiana technique in cooking fish and shellfish, as well as introduced pasta to the cuisine. And they were responsible for exporting both Louisiana ingredients, as well as the cuisine at large, to the greater world. Each of these 6 cultures introduced ingredients and techniques to this unique land, resulting in a duo of cuisines the world had never seen before, but which can now be found in every major city from Boston to Bangkok: Creole and Cajun. So…what’s the difference? Most of us don’t know. But it’s actually quite simple. Creole cuisine developed in the fancy kitchens and expensive restaurants headed by classically-trained French chefs. Ingredients like beef and pork and wine and cream were easy for the wealthy Creoles to acquire for their chefs. Their techniques were classical and sophisticated, firmly grounded in the French formal tradition. The Cajuns were also French, but closer to the peasant class than the wealthy Creoles. They were forced to settle in the Louisiana swamps after they were evicted from French Canada by the English. They were poor, and the land they claimed in Louisiana was largely too swampy to farm effectively. So they supplemented what basic crops they could grow with whatever they could find or catch in the swamp: alligator, venison, bear, muskrat and nutria, crawfish, fresh- and salt-water shrimp, etc. Their cooking techniques were more simple, based around stews and sauces that could be made once and extended to fill many meals. So…at its most basic, Creole is sophisticated technique applied to pricier (at least back then) ingredients. Cajun is more low-country, farmhouse-style cuisine made with easily and cheaply acquired (at least back then) ingredients. Easy enough, right? For our amuse bouche, we chose a Cajun classic…”dirty rice,” which is just leftover rice cooked with the cheaper cuts of meat, like liver and gizzards, along with bell peppers, onions, and garlic. We made our dirty rice, and then formed little balls with it, and deep fried them until they were crispy on the outside, like Sicilian arancini, and served them up with a little Crystal’s hot sauce…a classic hot sauce that you’ll find on every restaurant table in Louisiana, from humble diner to elegant bistro…but rarely outside that state. I can’t get enough of the stuff. I can eat it by the spoonful, it’s so good. I order it by the case. It puts Tabasco to shame. Really. 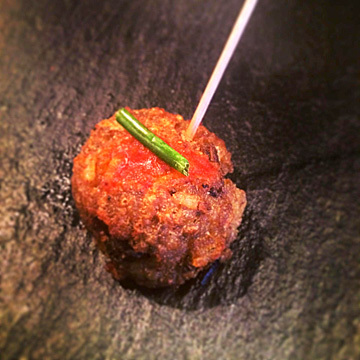 We unabashedly named these delicious miracles “Dirty Rice Balls” and our guests got a big kick out of it. 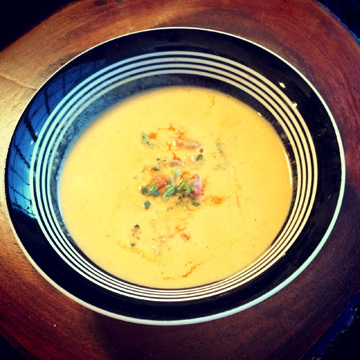 Next up was a soup…Creole Crawfish Bisque. For those of you intimately familiar with Louisiana cuisine, you know there are two VASTLY different dishes referred to as “crawfish bisque” in Louisiana. The Cajun version is actually more popular, it’s basically crawfish heads stuffed with rice and vegetables and stewed really slowly. It has nothing to do with traditional French “bisque,” but it’s delicious, all the same. However, we presented the Creole version in the classic French style. 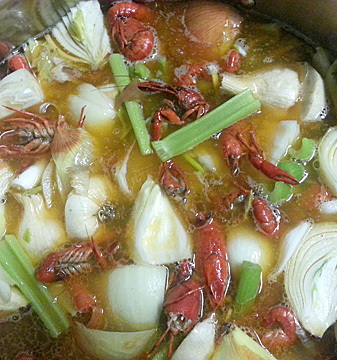 We started with about 20 pounds of crawfish shells and tails that were left from my Mardi Gras crawfish boil, and with that I made 5 gallons of crawfish stock, along with lots of vegetables and white wine. Then I reduced all those gallons of stock to 1 quart of dark, explosively flavored concentrate. This was the base for our bisque, and Jennie built a truly spectacular soup out of it. I think, in fact, that the crawfish bisque was my favorite soup we’ve ever served in the history of FRANK, and it was a runaway favorite with our diners. Spicy, pungent, and impossibly creamy, with crawfish tail meat folded in at the last minute. It was back to Cajun for the next course, which we based on an old Cajun standby called “maque choux,” corn kernels cooked in bacon fat with red peppers and onions into a dish that can range from soup consistency to the way we served it, which was more like a hash. The Native Americans had been cultivating corn long before the Europeans arrived, and they taught the Creoles and Cajuns how to grow and cook it. Also on the plate were stewed mustard greens, another staple for the Cajuns, as mustard grows wild all over the state and was easily foraged. I hated greens growing up, especially mustard greens, but then I learned how the Cajuns make them…with plenty of bacon, onions, an inexcusable amount of garlic, and tons and tons of vinegar and pepper sauce. Now, I’m a full fledged addict, and when mustard is growing wild all over Dallas in April and May, I forage and eat them Cajun-style almost every day. Alligator meat is tricky, because it’s incredibly lean…which means it’s healthy for you, but overcooks and dries out in a heartbeat. The single best use for gator meat is in sausage, where added pork fat keeps everything moist and tender. (You can also brine it and deep fry it, and it’s delicious as long as it’s not overcooked.) Alligator meat is paler and leaner than chicken breast! Our gator meat came from a farm in Louisiana, which we were able to source through Clark at Arrowhead Meats. (He does sell to the public.) 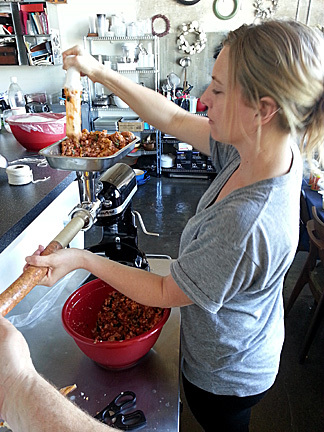 Using my wicked new all-stainless meat grinder attachment for the Kitchenaid, we churned out 10 pounds of gator sausage, spiced heavily with cayenne and smoked paprika, and seasoned with onion, garlic, wild garlic stems, red and green bell peppers, carrot, and celery. Then we baked them until set, and then cooled, sliced, and seared until a lovely crust formed. 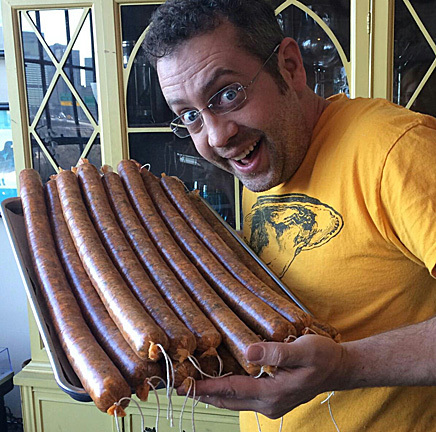 The gator sausage was also a big favorite. And rounding out the maque choux plate was a garnish of pickled okra. This maligned plant was brought to the new world by African slaves, and Southern housewives promptly botched it up by not cooking it properly, so most people hate it. Ask Gordon Ramsay, who, during my signature dish presentation on MasterChef, was curious about the fact that I had eaten virtually everything on the planet during my travels, from termites to beetles to monkey brains. He said, “Is there anything you won’t eat?” “Nothing,” I said. “You’ll even eat lady’s fingers?! ?” he said, baffled. I wasn’t sure what he meant, other than actual lady’s fingers, and my look of bewilderment made him realize I had no clue what we was referring to. “Aukra, I think you call it here. That slimy, gooey thing.” And I laughed. I love okra. But not cooked the way it’s so often cooked here…boiled or steamed into a mucilaginous mess that makes you gag with every bite. The Africans knew that okra’s slime needs to either be put to use (as a thickening agent, like in gumbo) or it needs to be cooked through until the mucilage is gone (as in crispy fried okra). Or, as in FRANK’s case, pickled…as the acid tends to neutralize the mucilage and leave the okra nice and crisp. Since we’re not in okra season right now, pickled okra from last season was really the only way we could serve this staple of Louisiana cuisine. Onward to the next course, a palate cleanser of bourbon sorbet, pungent with ginger and orange. We reduced several bottles of bourbon, a New Orleans favorite…(ever hear of Bourbon Street? )…until it was sweet and rich, and simmered it with ginger to extract the flavor. Then we added orange juice and zest and froze it, and although it was only a few bites’ worth, people were begging for more. Unmistakeably bourbony, but sweet, tart, and spicy at the same time. 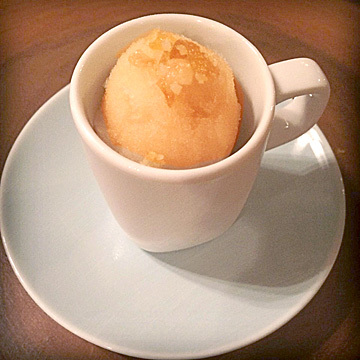 Bourbon sorbet isn’t a classic of Louisiana, but bourbon itself was much revered by the wealthy Creoles, who would also have had access to imported ingredients like ginger and oranges, so this course fits squarely in the Creole tradition. We topped it with candied ginger. The main course was based on etouffee, which is fundamental to BOTH Cajun and Creole cuisines. 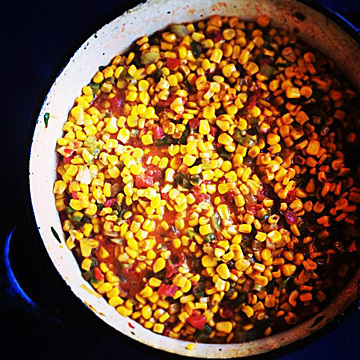 “Etouffee” is a French word meaning “to smother,” which describes the technique for this dish. Meat is placed into the pan, and then buried in aromatic vegetables, and in their juice, the meat cooks. Our etouffee was based on chicken thigh meat, since we had already used so much shellfish, and the featured protein on the plate would also be shellfish (more on that later). We simmered our etouffee all night long so the flavors could really meld, and spiced it generously with both cayenne and fermented pepper sauce. 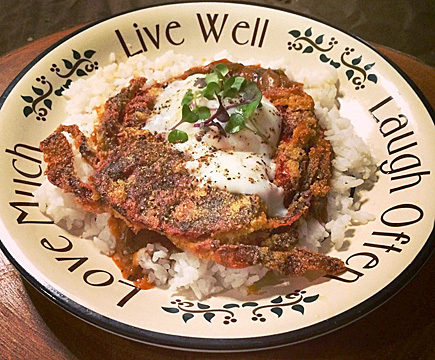 We served it over rice, topped with a 63.5 degree egg from our flock of chickens, and that most quintessential of all New Orleans proteins: the soft shell crab. The Native Americans were the first to discover that the blue crab, native to the Gulf of Mexico and the brackish Lake Pontchartrain, could be eaten whole only in the moments after it sheds its shell during the spring molting season, and they taught this to the Creole settlers. 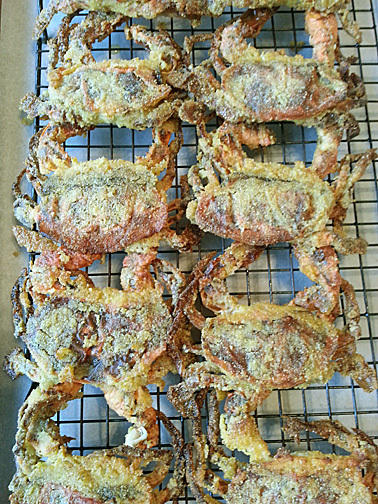 All documentation of the eating of soft shell crab around the world came from Louisiana. Few of us have eaten it, and most of those who have still don’t know how truly miraculous it is that we can enjoy this exquisite protein. Each spring, blue crabs begin to puff up their bodies inside their shell, which expands the shell to the cracking point. Experienced crabbers know how to visually identify these “busters” when they are caught, and they transfer them to a special tank, which is watched over like a hawk by another crabber. Once the crab busts out of its shell, its entire body is soft and delicate, but it immediately begins to harden into a new shell. If the crab isn’t eaten or frozen within 4 hours, the new shell is hard again. Buying trucks make the rounds past the crabber’s shacks every 2 hours during “busting” season, immediately taking the soft shell crabs to New Orleans restaurants, or to processing facilities where they are either frozen solid, or held in 33 degree water to slow the shell hardening process for distribution “live” to restaurants and gourmet markets around the country. But these live, chilled crabs must still be cooked and consumed within hours or their shells harden over. It’s really, truly remarkable. I had my first taste of soft shell crab in New Orleans, and I will never forget it as long as I live. If you’ve ever sat through a blue crab dinner, you know how annoying it is to pick through all those sharp shells to get a few tiny morsels of delicious, sweet meat. The soft shell crab is cooked and eaten whole, and it’s a wondrous mixture of textures from slightly crunchy to chewy to succulent. And it’s hard to believe you’re eating the WHOLE CRAB. 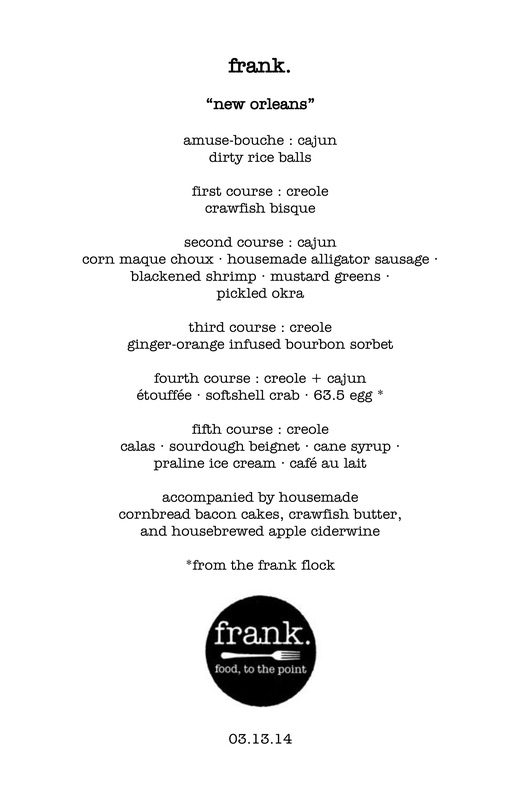 Jennie and I have been waiting for an opportunity to serve soft shell crab at FRANK, and this menu was the perfect opportunity, as New Orleans introduced the world to this miraculous meat. On our plate, the crab was clutching at a 63.5 degree egg, which I’ve explained in detail in previous FRANK blogs, but is always a huge hit with our diners. It’s an egg cooked for an hour, inside its shell, at low temperatures just above the coagulation point for egg proteins…about 174F, or 63.5C. The texture is like nothing you’ve ever tasted, like the most delicate custard ever. The yolk doesn’t run, it’s lightly set, like fine silk. The white is the exact same texture. Heavenly! This was a really epic plate of food…one we were very proud of, and that our diners were blown away by. Most of them were tasting soft shell crab for the very first time. To see our recipe, which involves buttermilk brining, then breading in spicy cornmeal, and oven frying, click here. And then God said, “Let there be dessert.” And there was dessert! Creole dessert, to be precise. And, most certainly, beignets were a part of it. Many of us are familiar with these pastries, made famous by the New Orleans institution Cafe du Monde, which serves them up 24 hours a day. I took a bit of flack on Facebook by criticizing Cafe du Monde’s beignets, but even New Orleans residents know that it’s more tradition than deliciousness that causes people to wait in line for hours for some honestly mediocre fried dough. There are plenty of restaurants serving much better beignets in the city, but Cafe du Monde is still a must-do when you’re there, just to say you did it. Our beignets were risen the old fashioned way…the way the French used to make them before commercial yeasts were available…with our sourdough starter. It makes the texture and flavor SO MUCH BETTER, impossibly crisp and flaky on the outside, chewy but still light and yeasty on the inside, and with that amazing tart finish that perfectly balanced with the LIGHT dusting of powdered sugar we put on top. (Cafe du Monde absolutely buries their beignets in powdered sugar, and you see most people cough a little as they take their first bite, as they inhale all that powder!) 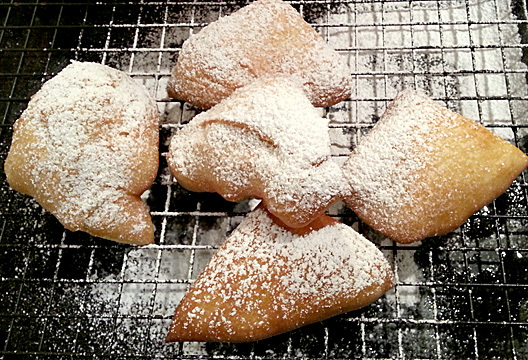 Originally French, beignets were a popular breakfast item for the Creoles. Click here to get my recipe for sourdough buttermilk beignets! Alongside the more familiar beignet, we served another Creole breakfast pastry, this one nearly forgotten in modern times: calas (pronounced “cah-LAHS”). The Africans brought this recipe with them into the kitchens of the Creoles as a way to use up leftover rice from the previous evening’s meal. (They were also the ones who introduced rice to the New World and taught the European settlers how to grow it, mill it, and cook with it. We had native grasses at the time that produced the black seeds which we call “wild rice,” but brown rice and its milled version, white rice, came to us from the Africans brought over as slaves.) The cook would inoculate the cooked rice with yeast and let it rise overnight. 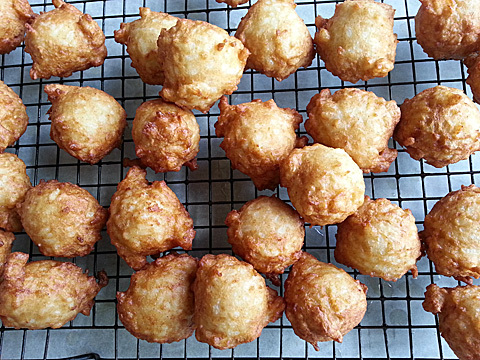 The next morning, eggs, sugar, spices, and a little flour were beaten into the rice, allowed to rise for a few minutes, and then were deep fried into fritters that were crisp on the outside, but moist and tender and sweet on the inside. Jennie and I were so puzzled by this method of using yeast to leaven rice…neither of us had ever heard of it before. 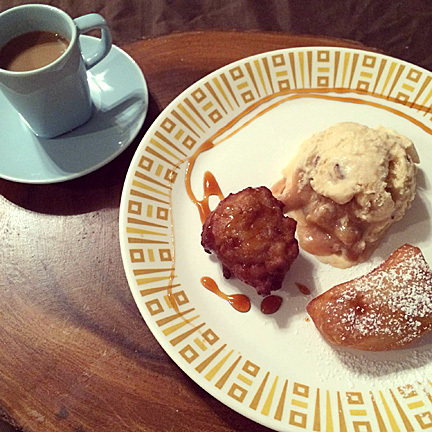 So we experimented with calas a bit, and both fell in love with it. Our diners loved it, too…a few folks said it was their very favorite thing on the menu. Here’s the recipe if you’d like to try using up some of your leftover rice! We served the calas with a drizzle of cane syrup…a Louisiana tradition. Cane syrup is a byproduct of the sugar-making process, and it’s a dark, rich syrup, a little milder than molasses, but far more bold than maple syrup. It’s delicious, and you can find Steen’s brand cane syrup in most grocery stores these days next to the molasses. Both beignets and calas were traditional breakfast items for the Creoles, served with steaming cafe au lait to dip them in. Cafe au lait is very strong coffee served with an equal amount of steamed milk. But in 1800s Louisiana, coffee was incredibly expensive, and the Native Americans informed the settlers that the root of a common plant growing wild all over the place could be dried, roasted, ground up, and steeped in boiling water to produce a flavor remarkably similar to coffee. This plant was the dandelion! The Europeans were not shocked by this…in fact, a native European plant they called chicory had been used as a substitute for coffee for several centuries. The name “chicory” ended up getting associated with dandelion, and although European chicory was brought over and cultivated as a coffee substitute, dandelion root was used far more often, and also referred to as chicory. Imported coffee supplies were invariably stretched by the addition of these roots, and the Creoles developed a strong affinity for the unique flavor combination. When the price of coffee dropped and they could suddenly afford to drink straight coffee, they discovered that it was “missing something.” So, to this day, New Orleans coffee shops still serve coffee with dandelion or “chicory” root…as we certainly did at FRANK. And we always feel a little weird if we don’t put an ice cream on the dessert plate at FRANK, so we served praline ice cream alongside the beignets and calas. Pralines are a traditional French dessert that were formerly made with either sesame seeds or hazelnuts. Pecans, however, were native to Louisiana, so Creole chefs used what they had access to…which ended up being far superior to either sesame or hazelnut in taste, and now the French covet pecans from the American South for their finest pralines. We made pecan pralines from scratch, and folded them into a rich ice cream sweetened with cane syrup and salted caramel. These four components came together in what may be my favorite dessert we’ve ever served at FRANK. And while our diners were busting at the seams by the end of this epic meal, we did catch site of a few ladies stealing their husbands’ dessert plates to polish off the last bite of ice cream! New Orleans FRANK was one of our most enjoyable menus to date. Hard. Complex. We were up later each night than at any time in our history. Even “rustic” Cajun recipes don’t come together quickly. These two distinct cultures take their food more seriously than perhaps any other business in life. And the food, like the people, is a bizarre and miraculous fusion of influences from 3 continents and 6 cultures which, over a period of 2 centuries, melded into one of the most iconic and revered cultures and cuisines on the planet. There’s a reason Anthony Bourdain says that New Orleans is the most interesting and important food city in the country. And if you’ve never been, maybe it’s time to start planning! Feel free to comment below, and if you’d like to dine at FRANK, check out our website! This entry was posted in Blog, FRANK and tagged blackened shrimp, cajun, Cajun vs Creole, crawfish bisque, Creole, Dallas, difference between Cajun and Creole, etouffee, Frank, macque choux, maque choux, menu, New Orleans, soft shell crab, underground restaurant. Bookmark the permalink. Very interesting story and as a historian I am glad to read about the history behind places and food! I like the approach to cover many angles. keep up the good work! Who would have thought anyone could touch my heart with a description of food? Beautiful. And I agree about the dessert. It looks and seems perfect.